The Black Pullet is an ancient Magickal Grimoire that introduces the "science of magical talismans and rings", including the art of Necromancy and Kabbalah. It is believed to have been written in the 18th century by an anonymous French officer who served in Napoleon's army. It also instructs the reader on the creation of certain magical properties, such as talismanic rings, amulets and the Black Pullet itself. The book covers the mastery of these extraordinary powers from these magical properties of the talismanic rings. Finally describes the generation of the Black Pullet, known as the Hen that lays Golden Eggs. The Grimoire claims that those who understands and attains the power to instruct the Black Pullet will gain unlimited wealth. This edition, updates the original grimoire, were required. 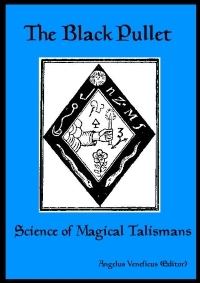 and analyses the actual talismans to current occult laws. Finally, this is an interesting book purely from a historical perspective.